Now I’m back on my blogging feet I felt the need for a meme….after all, it’s ages since we had one! What better time than National Family History Month (NFHM)? Tucked away in the Top End I don’t have quite the smorgasbord of options available interstate, so this is my contribution. Here goes, who wants to meme with me? I’ll collate the answers in a couple of weeks to give you time to participate around other events…hopefully it will be fun, easy and quick to complete. Don’t forget to leave a link to your post in the comments! What are you doing for NFHM? What do you hope to learn in NFHM? Do you research at a family or local history library? Do you do all your research online? What’s your favourite place to store your family tree? How do you preserve your family stories for future generations? Have you any special research projects on the go? What is your favourite family history research activity? What is your favourite family history research place/library etc? What is your favourite website for genealogy research? Are you part of a Facebook genealogy group? If so which one? Do you use webinars or podcasts for genealogy? Any tips? What genealogy topic/class have you learnt the most from this year at a webinar/conference/seminar? Do you have a favourite research strategy to knock down your brick walls? Have you used DNA testing for your genealogy? Have you made cousin connections through your DNA tests? 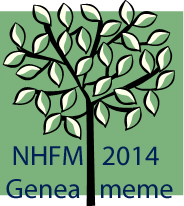 Do you have a wish list of topics for NFHM 2015? What do you most love about your family history research? This entry was posted in Geneameme and tagged geneameme, National Family History Month 2014 by cassmob. Bookmark the permalink. I have just got into bed with my iPad & a cup of tea. I was planning to read but thought a quick email fix…..what a great idea, I’ll join you, but not until tomorrow, the genea-girl needs her beauty sleep! Great! enjoy your beauty sleep. Great idea Pauleen and I will be joining in – hope to get it done in the next day or so! I’m amazed you have time Shauna with all you have on! May give some good ideas for 2015. I’m on for the challenge but may need more than a few days. no problems Jill – when you’re ready. Hi, me again. When ever there is a wordpress login for comments it takes me ages to get it working because I have other wordpress logins for work so sorry it posted the link to your blog as I was cutting and pasting into different browsers to try and get it to post. SORRY!!! Please delete/edit all unnecessary commenting. Thanks. No problems Fran. Great you have been able to participate in this meme…and your first too! I found your responses extremely interesting. I think we’ll see a lot of diversity across people’s responses. I will be interested to check out the others when you compile them. Thanks for joining in Shauna -I know how busy you must be. My effort is here: http://geniaus.blogspot.com.au/2014/08/national-family-history-month-2014.html Thanks for creating this activity – took quite a while but was illuminating. I think it’s interesting to see ho we all do things slightly differently. But you’re on a winner with PIP and a Geneadictionary. Yes, a One Name Study may have to wait. Glad you could join us on this journey Jane. Your comment about Family Historian is very useful to those wavering about which program to use. Thanks Jane…will keep that in mind when I get back to playing with the program. I really appreciate the offer and will take it up with you later on. And I coughed up for membership of the GOONs today. Hey that’s another word for the dictionary. Thanks for joining in Alex. I enjoyed your post a lot…FH seminars at work…what a hardship 😉 Sorry about the delayed response -a blog-free day yesterday. You asked some thought-provoking questions, Pauleen. My answers are on http://genie-leftovers.blogspot.com.au/2014/08/national-family-history-month-2014.html. Thanks for joining in Judy….seems we are research “simpatico”. I absolutely loved your fresh approach to this meme and your exuberance and enthusiasm for family history! Other readers would thoroughly enjoy Caitlin’s video on the meme – she made me smile throughout with her evident love of genealogy. Thanks Caitlin! No problem Frances…I won’t summarise for another week to give people time. enjoy your sleep-ins. Thanks for joining in Sherie. I’ll be collating all the responses today.